I hope your all enjoying your Sunday! I've been trying to make the most of today, as its my only day off this weekend. However, I'm being whisked away on a luxury overnight stay this Thursday.. so I shouldn't complain. I have to admit I love a Sunday and over the past few months I have started a Sunday routine, which I really enjoy! In the morning I tend to have a cup of tea and get some blogging done, as well as snapping a few blog pics for the week ahead. Me and Daniel then get ready to visit my sister and her family, which is always fun! I especially love spending a few hours with my little angel Honey. After we leave my sister's house me and Daniel pop to our local town for a Costa Coffee or a light lunch at our local garden centre depending on how we're both feeling. 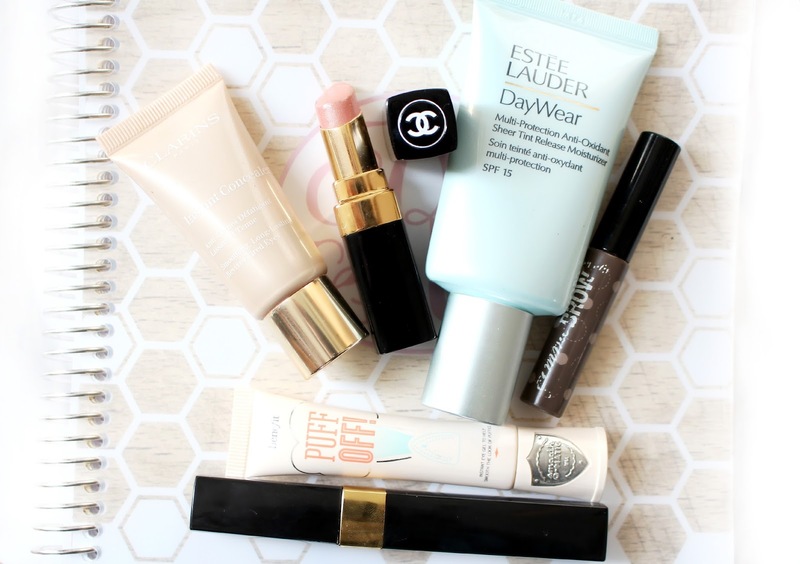 So, I thought why not get a bit of a Sunday series going and today I wanted to post about a few of the beauty products I like to use for a more "low key look". I'm actually in the process of buying some bloggy equipment, so that I can do more portrait imagery, looks and a few OOTD's too! On a Sunday I still like to wear a little bit of make-up, especially when going to town.. but its a completely "barley there" look, which is just enough to make me feel like I don't look super tired. I hope you enjoy this more chilled out Sunday post and I would love to hear from you in the comments section below. If your stopping by from #bbloggers then a huge hello and welcome to my blog :) You can also use my social media icons to the right hand side if you would like to get in contact with me a little quicker! Now I don't want to give to much away here, as I have a full review coming on this little beauty soon. However, I have been completely in love with this product since purchasing it. I love the way it adds a subtle warmth to my face! It doesn't really have any coverage, but somehow it manages to transform my complexion and make me look and feel a lot more refreshed! You might have seen my recent review of this product (below) but I'm seriously loving it right now. It's kind of a mix between a skincare/makeup product, which is great as I get the best of both worlds, plus it totally wakes my eyes up.. which is definitely needed on a Sunday! I must admit I do get really self conscious about my under-eye area! I don't even think it's as bad as I think it is, but I'm not the best sleeper.. so I constantly feel like I look tired. The Clarins Instant Concealer is a great product and I love the fact that it covers up my darkness, but it's really fluid and refreshing at the same time. It also seems to sit really well over Benefit's PUFF OFF, which is great and makes using the two together really easy. My Gimmie Brow is looking a little battered and bruised, but I love it! I find that a quick swipe of this totally makes over my brows, which is important for me even on a Sunday! This has been in my collection since I was 16 and I have really stayed faithful to it. It's not the most thickening mascara, but it makes my eyes look so awake, without any clumping! which totally works for my low key Sunday look. I'm gutted that Chanel are discontinuing these lipsticks, but I have faith that they will bring back an even better formula! Secret is a perfect barely there shade, which is enough to give your lips a fresh looking hint of Pink. The formula is also super moisturising, which is great as I don't have to worry so much about using a balm. gorgeous products! 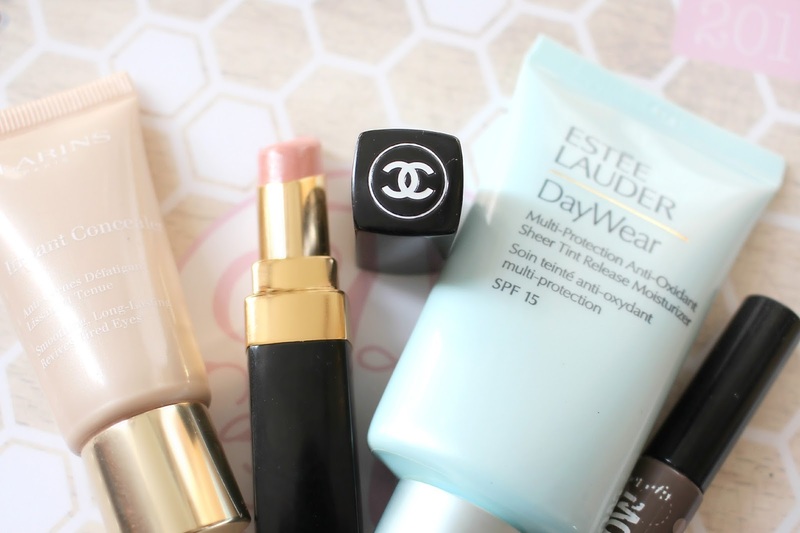 i have that clarins concealer too and its great! The Chanel lipstick shade looks lovely! That's so sad to hear that they're discontinuing those lipsticks! I had no idea! I think you're right those they'll definitely bring out a better formula! Great blog post! I hope your equipment hunt is going well for you. I recently bought a ring light, but have not used it single time. The makeup collections seems like a good group of trusted goodies. I would like to introduce brow mascara to my routine. i think i will start with the maybelline version first though.